How do you prefer getting your entertainment? S, DVD, Blu-ray, and video game rentals. The first Blockbuster store opened October 1985 by David and Sandy Cook. The interest of the VCR was on the rise and David wanted to have a business that was cost-effective and efficient. What made Blockbuster different than family-owned video shops is the computerized inventory and had the videos on the sleves. Unlike other stores, cusomters still had to wait for the clerk to find the movie in the backroom. Blockbuster allowed cusomters to keep the movie for three nights instead of one. Blockbuster, like most other rental stores, tended to stock more copies of new movies than older releases, in order to capitalize on heavy consumer demand for new release titles. The trade term is "depth of copy". Titles that are more than 12 months past their initial release date were stored as "Blockbuster Favorite" (non-new release) titles. Typically only one to four rental copies of each title were retained past the first year of release. The large volume of new release copies were typically sold after the initial renting rush. Some of these copies were sold as "previously viewed" for around $10–$15, sometimes as low as $3.99. 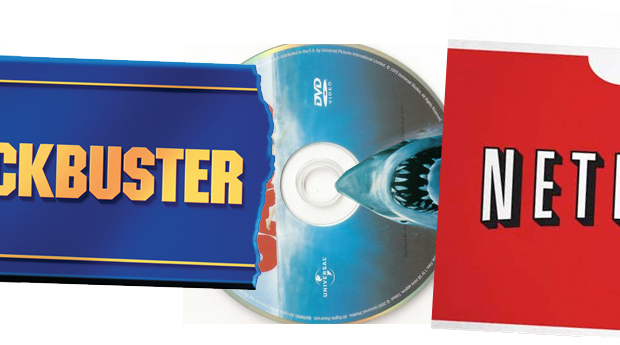 Most Blockbuster locations also accepted trade-ins of used DVDs which are sold alongside the existing stock of previously rented movies. In 2004 the company launched its own online rental service, Blockbuster Online, to try to gain back some of its market share. The system of charging late fees by the night was replaced with a new model that let customers buy their rented DVDs after a certain time period instead. Redbox is service that rents out movies and games through a vending machince (kiosks). Redbox started in 2004 using re-branded kiosks manufactured and operated by Silcon Valley-based DVDPlay. The self-service vending kiosk combines an interactive touch screen and sign, a robotic disk array system and web-linked electronic communications. Kiosks can be located indoors or out and can hold more than 600 DVDs with 70–200 titles, updated weekly.The customer pays with a credit card or debit card. DVDs can be returned the next day to any of the company's kiosks; charges accrue up to 25 days, after which the customer then owns the DVD (without the original case) and rental charges cease. Customers can also reserve DVDs online, made possible by real-time inventory updates on the company's website. A Redbox kiosk rents its average DVD 15 times at an average of $2 per transaction plus any applicable taxes. Each fully automated redbox kiosk holds approximately 630 DVDs, representing up to 200 new release titles. New titles are available at redbox every Tuesday. The complete rental transaction takes only moments. Consumers 18 years of age or older can use the touch screen to select their favorite movies, swipe a valid credit or debit card and go. Netflix Inc is a service of online, on-demand video streaming, and rental-by-mail, DVD and Blu-Ray Disc. Marc Randolph and Reed Hastings founded Netflix in 1997 and headquatered in Los Gatos. When the company was started as a pay-per rental, about $4.00 + $2.00 for postage. As there was more subscriptions, the company started flat-feeunlimited rentals without due dates, late fees,shipping fees, or per-title rental fees. Netflix has more than 3 billion movie ratings from members. The average member has rated about 200 movies. Netflix members rate about 4 million movies a day. If Netflix members drove to and from a rental store, they would consume 800,000 gallons of gasoline and release more than 2.2 million tons of carbon dioxide emissions annually. More than 90% of Netflix members say they are so satisfied with the Netflix service that they recommend the service to family and friends.